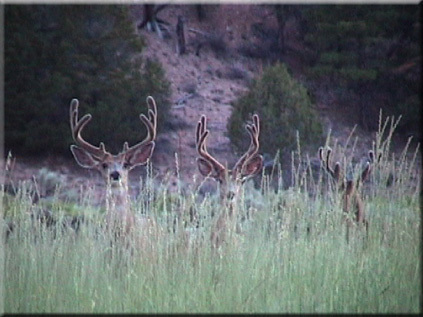 Karl snapped this shot of 3 young bucks. We have film of the the narrow 3-point in the middle in 2002. In washington, the one on the far left would be considered a bruiser! Hey MASTER is the your buck on the right hiding in the grass. That is a MONSTER. i’m with detta. the smallest we shoot are like the one on the far left, or maybe just a little bigger. okay, alot bigger! hey guys, just go to the next picture to the right, thats the kind of buck we see and shoot in utah.